GLETSCH, Switzerland — To hear the locals tell it, you would think they were referring to a loved family member declining in old age. The shrinkage has consequences for the little village that owes its name — Gletsch means glacier in Swiss German — and its very existence to the icy behemoth. Like most of the people in Gletsch, Mr. Carlen, 45, spends only the summer in the village; in the winter he practices law in the nearby town of Brig. Gletsch began its role as a summer residence in the mid-19th century, Mr. Carlen said, when the family of a soap maker named Joseph Seiler opened a small hotel here that grew over the years into an establishment consisting of two wings, with accommodations for 150 guests and a pampering staff of 300. The first tourists were British aristocrats and their families. The Seilers' hotel had its own butcher shop, bake shop, post office, and even a chapel that still stands, with its slender belfry, for services in the Anglican rite. The family later built a second hotel, up the mountain nearer to the glacier, that Mr. Carlen now owns. In those days, Mr. Carlen said, the glacier spilled down into the valley below, almost reaching the edge of the village. 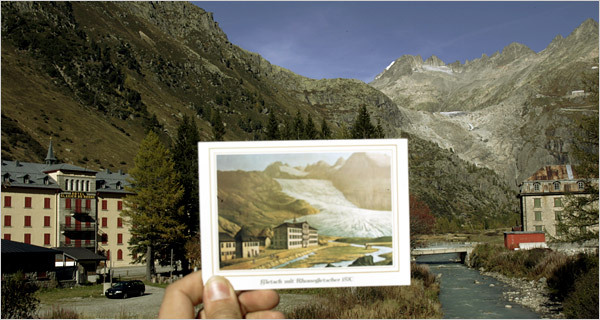 But as the glacier shrank, so did the number of visitors to the hotel; the automobile challenged a little steam railway as a means of access to Gletsch and made day trips possible, and the number of guests fell further. "It was not necessarily the shrinking glacier, but today people come by car, and don't stay overnight," said Armin Jost, standing in the shadow of Gletsch's large post office, now boarded up. Mr. Jost, 31, takes care of the roads, in the season when Gletsch is accessible to traffic, and keeps an eye on the buildings. The hotels, he said, now stay open only from May to October. In winter, snowfalls accumulating to the hotel's second story, and with drifts even higher, cut Gletsch off from the world. "In the old days, two or three hotel employees would spend the winter in the hotel to look after it, only emerging in the spring," he said. First the Seilers sold the hotel in the village to the local government; in the 1980’s they sold the second hotel to Mr. Carlen's family. The glacier's suffering is not unique. All of Switzerland's glaciers — and there are more than a hundred, large and small, experts say — have lost about 15 percent of their surface in just the past two decades. The experts say global warming is the reason, though particularly hot summers, which might have happened anyway, also played a role. "This year was a terrible year for the glaciers," said Max Maisch, an expert on the topic at the University of Zurich. "July was very hot, though August was cool; but September was the warmest in 140 years. Many glaciers are collapsing on the edges." In recent years, to help the Rhone glacier over the hottest months, Mr. Carlen has taken a lesson from the care of stranded dolphins and whales, and has spread large tarpaulins of special fleece on the glacier’s edges during the hottest months. "It helps a little," he said, explaining that it has reduced the shrinkage to about five feet a day. The diminution is painful for Mr. Carlen because for four generations his family has been boring a tunnel each year into the glacier, so tourists could enter its icy confines. But with the shrinkage, the tunnel, 120 yards long, must be dug and redug, farther up the mountain, by chain saw. Now a zig-zagging lace of paths and planks covers the side of the mountain that visitors must climb to get to the mouth of the tunnel. In winter, the tunnel has other uses; Mr. Carlen stores barrels of wine there. Walther Meier, a retired pharmaceutical employee, and his wife stood near the chapel gazing up the mountain where the tongue of the glacier was just barely visible. They had hiked up the valley toward the mountain and had passed stone markers, with the years 1818 or 1856, that showed how far down the valley the glacier once stretched. Mr. Meier recalled his last visit to Gletsch 15 years ago, when much of the glacier was still visible from the village. "Every year it recedes quite a bit," he said, shaking his head. Mr. Carlen is philosophical, reflecting that things could have been worse. In the early 1980’s, he said, the Swiss government drew up plans for a dam and a power station at the end of the valley that would have submerged Gletsch. "Those plans remain in a drawer in the government building," he said. "And I hope that’s where they stay."